In celebration of World Rabies Awareness Day, we would like to remind you that the first step to protecting your family from rabies is getting your pets vaccinated. Not only is it required by law, but it is an easy and nearly painless way to stop the spread of this deadly virus. Make sure your pet is up-to-date with his or her rabies vaccine. If your pet’s rabies vaccination is overdue, please call our hospital so we can schedule a vaccination appointment! Along with vaccines, it is important to educate yourself about the rabies virus. The more you know, the better you can protect your family, yourself, and your beloved pets from this deadly virus. Rabies is carried by warm blooded animals and is typically fatal. Rabies is one of the oldest diseases known to man. Aristotle in 300 B.C. described this disease as being caused by the bite or tooth scratch of an infected animal. He further stated that once the symptoms of the disease appeared in man or animal, death occurred in a few days. This is as true today as it was in ancient times. Rabies is transmitted through bites and less commonly, scratches. If you are bitten by any wild animal or a pet with no rabies vaccination history or out of date vaccine, you should go directly to the hospital for treatment. If possible, you should try to contain the animal that has bitten you or contact your local animal control officer to assist with the capture of the animal. If you work with wild animals regularly, you should speak to your doctor about getting vaccinated for rabies to prevent infection should you be exposed to the virus. 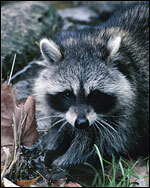 More than 90% of all animal rabies cases reported to CDC each year occur in wild animals. The main animals that get rabies include raccoons, bats, skunks and foxes. One of the best ways to protect yourself and your family is to avoid contact with wild animals. Do not feed or handle them, even if they seem friendly. Unfamiliar animals that are often thought of as pets, such as dogs and cats, should also be avoided. These animals are often in contact with wildlife and can also transmit rabies to humans. If a wild animal is in or near your home, do not panic! Clear your family from the area and open doors and windows to allow the animal to escape on its own. If the animal doesn’t leave, call your police department or animal control officer. DO NOT try to pick up a wild animal, particularly one that is either cornered or injured. A cornered animal has the instinct to bite. One easy way to prevent wild animals from coming too close to your home is to cover and secure your garbage cans. Some of the human rabies cases in the United States have been caused by rabies virus transmitted by bats. Awareness of the facts about bats and rabies can help people protect themselves, their families, and their pets. This information may also help clear up misunderstandings about bats. When people think about bats, they often imagine things that are not true. Bats are not blind. They are neither rodents nor birds — and most do not have rabies. And while bats have an evil reputation for sucking blood, only three out of the thousand or so species of bat actually feed on blood. These vampire bats are found only in tropical Central America, and usually feed on livestock blood. Bats are incredibly beneficial animals and play key roles in ecosystems around the globe, from rain forests to deserts. Bats eat insects, including agricultural pests and mosquitoes. One large brown bat can consume up to 6,000 mosquitoes in one night. The best protection we can offer these unique mammals is to learn more about their habits and recognize the value of living safely with them. Most pets that have died from rabies were either never vaccinated against rabies or never received booster vaccines. Most people that have died from rabies did not understand how to prevent rabies or the necessary post exposure protocols that needed to be taken. On September 28th please take the time to educate your family on this serious threat and check to make sure that your companions are protected. If you have any questions about rabies, the status of your pet’s vaccination, or any other issue, please feel free to contact us.